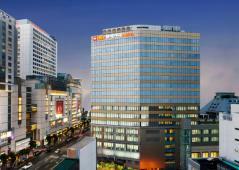 The French hotel company Accor and Korea 's Ambassador Group with 50 years of tradition worked together to open Ibis Ambassador Myeong-dong in M​​ay 2006. It enjoys spotlight for having applied the international standard. All guestrooms are equipped with LAN line for guests with laptops and both 110V and 220V outlets for domestic and foreign products. The reception desk is located on the 19th floor and guestrooms are on floors 10 to 18, with great views of Myeongdong and Namsam. Most amenities are conveniently located on the 19th floor including a buffet restaurant, lounge bar, fitness club, spa, conference room and business corner. The first floor entrance has employees on a 24 hour watch and only guests are allowed onto the hotel floor. Right across the hotel is the brand wing Avenue of Myeondong Lotte Department Store for a great shopping experience and Namdaemun Market, traditional Insadong, business center City Hall and Gwanghwamun are all within 10 to 15 minute walk. Historical sites including Gyeongbok Palace, Changdeok Palace, Jongmyo and Deoksu Palace are also 5 minutes drive away! ★ In front of the hotel has been newly established limousine bus stop.